September is known for being the end of summer vacations, and the beginning of the true business year. In fact, the month of September is believed to be a barometer of what is to come in the next fiscal year. Thus far, the economic data has been a little softer than we are accustomed to. The dismal jobs report has set the tone, so investors will likely be a little tougher on this week's releases than might otherwise be the case. We are looking forward to housing starts, building permits, and leading indicators later in the week. Naturally, Wednesday's Fed meeting will trump any economic report. The Fed isn't expected to take action, but there is a substantial amount of speculation on a hawkish change in commentary (meaning they could be looking to raise rates sooner than anticipated). The FOMC decision will take place at 2:00 pm Eastern. The Fed has generally been supportive for bonds and notes (at least since the "taper tantrum" that occurred over a year ago). This has been particularly true since Janet Yellen was handed the reigns. We suspect that will be the case this time around, but that doesn't mean the market can't troll lows (or make moderately new lows) first. We noticed that small speculators added aggressively to their short holdings in the 10-year note (according to the latest COT report). Thus far this year, any time this group has gotten largely bearish it has back-fired. We believe this will likely be the case again; after all, 'tis the season for bonds to move higher and lofty stock prices leave the door open for an equity correction that would leave Treasuries in favor. **Consensus:** We prefer being bullish on dips, but we cannot rule out a trip to 135 in the 30-year bond should the 10-year note opt to test 123'22. The September witch can be a "witch"
The September triple witch is known for being temperamental. If you aren't familiar with her, she is the day in which stock options, futures options, AND stock index futures contracts expire. The triple witch comes four times per year (quarterly). Sometimes this day is referred to as a quadruple witch because single stock futures also expire on this day, but they are highly illiquid and thus perhaps not significant enough to mention. According to the Stock Trader's Almanac, down weeks prior to the triple witch tend to trigger down weeks after the triple witch. Particularly, the September triple witch can be "dangerous" and "pitiful". Knowing this, it might serve traders well to look for a rally going into the Fed and Friday's triple witch, to get positioned for potential selling next week. We've already noted that the equity market tends to move higher into the Fed and the quarterly expiration. To go a step further, it is relatively common to see the market post an intermediate term (extreme) high the morning of expiration (Friday), only to succumb to selling pressure later in the day (or the following week). We'd love to see a sharp spike higher, so we can be comfortably bearish from better levels. **Consensus:** Back and fill in the ES, was likely a reload. 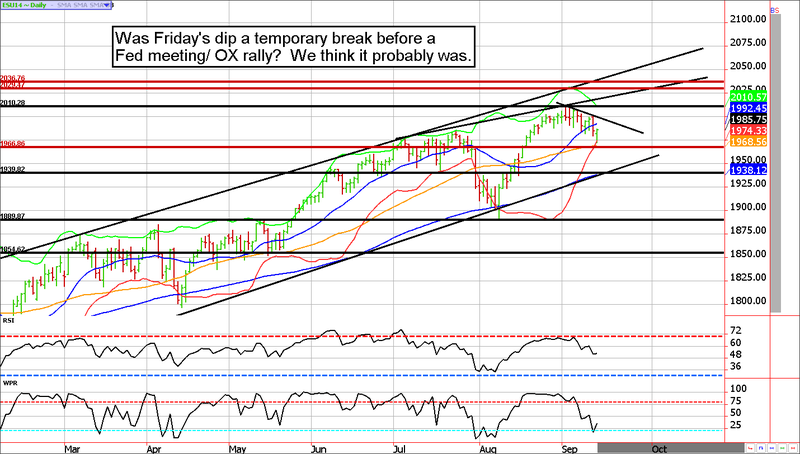 New highs "should" be seen this week. 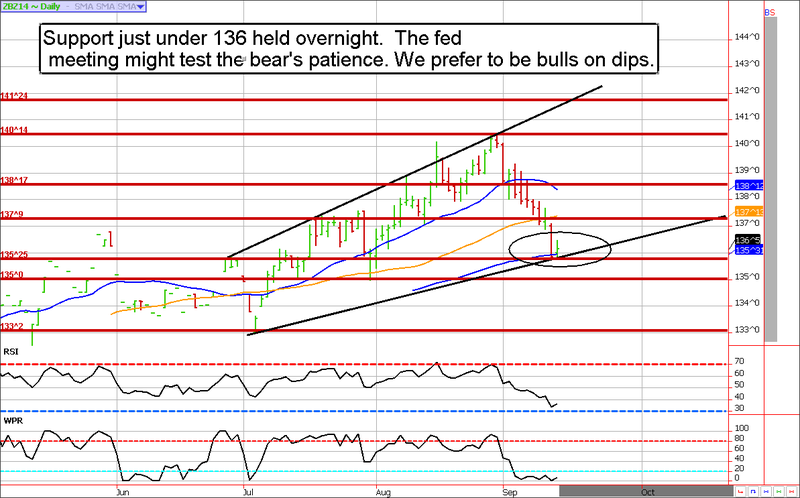 We'll wait for better prices to consider turning bearish. August 1 - Roll October crude oil 95 put into the 100.50/91 strangle.